So your child wants a trampoline. Let me guess, everyone else has one. Whilst as adults we feel the need to refuse such requests, dismissing them as indulgent; as parents it’s not quite so clear cut. Parents love their children, so when children make such a request, and quite frankly we know that all their buddies have trampolines, we are inclined to just give in. But, then there is the nagging doubt at the back of the parental brain… the what ifs. ﻿﻿Should I Buy My Child a Trampoline﻿﻿? What Kind of Trampoline Should I Buy? ﻿Should I Get a Trampoline or a Pool﻿? Where Should I Buy a Trampoline? Schools, in particular, were keen to adopt trampolining into their physical education programmes. However, a spate of high profile lawsuits involving serious injury caused by a lack of supervision and training, resulted in schools confining trampolining to the history books. These days, enthusiastic trampolinists need to pursue the sport in specialist gyms with skilled trainers. Nevertheless, trampolines have sprung up in backyards throughout the US. Trained supervisors are replaced with moms and dads and somehow the risks doesn’t seem quite so serious. After all, kids have bounced on their beds for centuries, isn’t jumping a normal part of childhood? Still, even those Olympic trampolinists, who are skilled and trained to the highest level suffer terrible injuries as a result of trampoline accidents. There is no doubt about it, every time a person uses a trampoline, they are putting themselves at significant risk. Should I Buy My Child a Trampoline? A quick internet search reveals horror stories and horrific injuries resulting from backyard trampolines and perhaps, like me you can remember trampolining at school and kids being sent off to hospital in air ambulances after somersaults that went awfully wrong. Perhaps you read a story in a newspaper about a child whose life was changed forever as a result of a brain injury following a trampoline accident. Still, whilst these stories make for grim reading, it is the case that the statistics tell us that incidents like these are really very rare. Of course, you might have heard the line that no medic would ever allow a trampoline in their own backyard. Yet, that’s simply not true. For every medical professional who doesn’t have a trampoline in their yard, there’s another one who does. The fact is, whether or not you decide to purchase a trampoline for your yard is a choice that only you can make. By all means, inform yourself of the pros and cons before finally making a decision on whether trampoline ownership is for you and your family or not. 1. Trampolines are fun and a great way to encourage your kids to keep fit. 2. Studies have shown that bouncing on a trampoline increases bone mass and strengthens the skeletal system. 3. Regular trampoline use improves posture. 4. Improves the cardiovascular system by increasing your heart rate and breath rate. 10 minutes on the trampoline provides a better cardio workout than a 30 minute run. 5. Allows your kids to exercise without putting undue stress on their legs or feet since the impact is less severe than with other forms of exercise. 6. Trampoline use helps to combat depression, anxiety and stress. It increases endorphins released by the brain. Regular trampoline sessions helps bouncers relax and promotes healthy sleep patterns which in turn results in an increase in energy. 7. 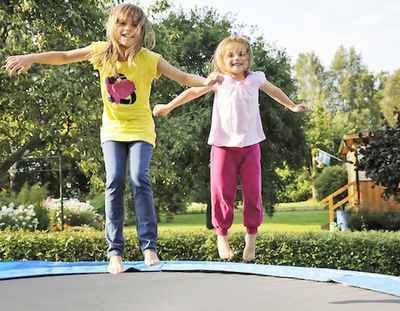 Having a trampoline encourages kids to go out and play in the fresh air. 8. Having a trampoline in your own backyard means that when your kids are out bouncing on it, you know exactly where they are. 9. Muscular contraction which takes place whilst bouncing on a trampoline results in improved lymphatic function. 10. Regular trampoline use will result in an improvement in balance and co-ordination. 11. 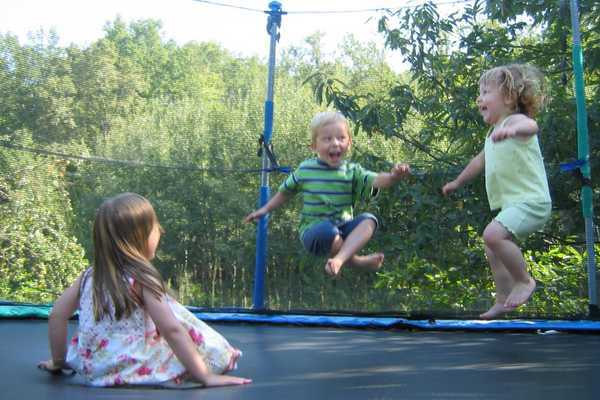 Regular use of a backyard trampoline might ignite a life-long love of trampolining or gymnastics. 12. The time it takes to master skills in the trampoline result in kids learning the skill of persistence. 1. Homeowner's insurance quite often does not allow trampoline ownership under the conditions of the policy. If you get one anyway; and your insurance company finds out, they will promptly issue a cancellation or non-renewal notice. Be aware that insurance companies do drive by inspections and often do find out about trampoline ownership. 2. If you have a trampoline in your backyard, you might feel like you're constantly supervising your kids friends and the neighbours kids while they bounce around having fun. 3. If a neighbour or friend’s kid gets injured on your trampoline, they may sue you. 4. There are over 90,000 injuries on trampolines each year in the US. Kids suffer sprains, fractures, spinal, neck, and head injuries. 5. The American Academy of Pediatrics and the American Academy of Orthopaedic Surgeons both discourage ownership of trampolines. This is because of the frightful statistics on injuries. 6. It’s fun to bounce with friends, but Three-quarters of all trampoline injuries happen when multiple people are bouncing together. Additional vibrations created when two or more bouncers are on the trampoline at the same time result in unpredictable and uncontrollable movements. It’s easy for a bouncer to fly off the side as a result of these uncontrollable effects of partner and group bouncing. 7. Children’s developing bones are fragile and still developing. Falling from a height (such as a trampoline) is an incredible risk to these young bones. 8. The padding covering the trampoline springs offers some protection, but if you land on it hard you will still risk a significant injury. 9. Whilst safety nets protect you from flying off the trampoline and onto the ground, they do not protect you from getting an injury on the trampoline itself. Unfortunately, this is where most injuries take place. 10. Many home trampolines are placed off the ground. Falls from heights increase the potential for injury. 11. Children under the age of six are particularly at risk from injury on trampolines. It is wise, not to allow children under six to bounce on them at all. 12. Many serious injuries occur when larger people are on trampolines alongside smaller people. Parents should endeavour to never bounce alongside their children. If you decide that trampoline ownership is something that you wish to pursue, you need to decide which type of trampoline to purchase. There are several designs and things to consider. It is worthwhile looking for a trampoline that is not going to be too difficult to assemble, has quality PVC covered padding over the springs and a durable net enclosure. Make sure that any trampoline that you purchase has a very strong frame. Many backyard trampolines use basic steel in their frames. These frames are more likely to rust and suffer damage from regular use. Make sure that you purchase a trampoline that has a frame made of galvanized steel, which offers a higher resistance to rust. A high-quality trampoline frame is of the utmost importance when choosing a trampoline and will give you more for your money in the long-run as it will last a lot longer than a cheaper one. You might be wondering, while considering whether to buy a circular vs. rectangular trampolines, if one frame shape offers more strength than the other? The shape of the trampoline is down to personal preference. A round trampoline or a rectangular trampoline will be equally good if the frames are made of the same material and are of equal strength. 1. When buying a trampoline, pay particular attention to the weight limits. Since exceeding these will compromise their safety considerably. Some trampolines are rated for just one user or children, whilst others are able to hold several hundreds of pounds of weight. 2. Ensure that the trampoline has an enclosure. An enclosure will protect users from accidentally falling out of the trampoline. 3. If buying a trampoline for a child younger than 5, buy one with handlebars. Smaller users have less stability than older users. Handlebars Increase stability significantly. 4. Make sure there is plenty of space. Don’t underestimate the a,punt of space that a trampoline takes up. Make sure that there is enough space in your yard for your trampoline, and more importantly that there’s enough clearance it. You also want to make sure that you place a trampoline on a soft surface, such as grass. Never place your trampoline on a hard surface, due to the high risk of injury if a person falls. 5. Pay attention to the safety features. Safety truly matters with a trampoline. You want to look for several different safety features: Including a quality enclosure, A good level of padding over the springs, galvanised steel frame, no gap enclosures and rust-resistant springs. 6. Research the manufacturer and read trampoline reviews. Pay particular attention to complaints. 7. Ensure your trampoline has a good long warranty. Trampolines have several parts, and therefore can break over time. Make sure that there is a good warranty in place to safeguard your investment. 8. Make sure there are spare parts available for your trampoline in order to ensure that it lasts for a long time. Springs can break, mats can become worn, and padding can begin to deteriorate. Should I Get a Trampoline or a Pool? Pools and trampolines invite a myriad of debate and discussion from parents over whether the dangers should discourage their use altogether. Some parents who are dead against trampolines, have pools and vice versa. Is a trampoline safer, or are pools, or should neither be permitted in the backyard of the modern safety-conscious parent. Yet, pools and trampolines are fun for children, and whilst both do pose dangers they also encourage children to develop a love for exercise and the outdoors. Nothing is completely safe and perhaps the real issue requiring deliberation and consideration is the level of parental supervision which ought to be afforded whilst kids are using trampolines and pools in their backyard. Children need to be taught safety, and deserve to know about the risks and dangers of harm, so that they can make informed decisions about their own well-being as they grow older. Parents should establish rules for their children to follow that are then enforced, they may have fun and be safe at the same time. Such positive parenting, allows children to have a sense of freedom, whilst knowing how to keep themselves safe in their backyard, and perhaps more importantly outwith the confines of their own backyard. Backyard Pools must be fenced, and gated. Parents must always watch whilst their children swim. Similarly, trampolines also require constant adult supervision. Most trampoline injuries take place when children are not supervised. Many serious trampoline accidents occur when children of disproportionate weights jump together and the smallest child becomes a missile, thrown from a trampoline with force and suffering a serious head or neck injury as a result. 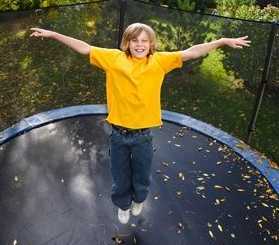 Trampolines are safest when they are buried in the ground or have safety nets on the side. Letting children jump without adult supervision is just as dangerous as allowing children to swim on their own. Trampolines are extremely popular these days, and as such are readily available to purchase. The can be purchased at Walmart, Target, Jumpsport and Amazon. There are many quality and budget brands to choose from too. So, where do you start, when looking to purchase a trampoline? Once you have settled on the size of trampoline that you want to purchase and what features it must have, it really is best to purchase online. This will allow you to compare the various trampolines available and to really pay attention to the features that they have. Remember to consider the warranty, as trampolines do need to be maintained and looked after to ensure longevity and that the safety is not compromised over time.